Comet assay or alkaline single cell gel electrophoresis assay was carried out to examine DOX-induced possible DNA damage in cardiac tissues, murine bone marrow cells and peripheral blood lymphocytes. In this purpose damage cell (%), head DNA (%), tail DNA (%), average tail length (μm) and Olive tail moment were analyzed (Table 5; Fig. 4). In vehicle control group, large round head and no tail was observed. In contrast, DOX-administration significantly (P < 0.05) increased the DNA damage, resulted in long comet tail formation in large number of cell population. Result showed that repetitive administration of DOX significantly (P < 0.05) increased the percentage of damage cell by 86.88%, 85.59% and 82.57% respectively in cardiac tissues, bone marrow cells and lymphocytes compared to vehicle control group. In contrast, co-administration of I3C in concomitant and pretreatment schedule significantly (P < 0.05) decreased the percentage of damage cell in cardiac tissues, bone marrow cells and lymphocytes by 52.23%, 51.05%, 46.06% and 72.19%, 70.02%, 64.61% respectively compared to only DOX-treated mice. 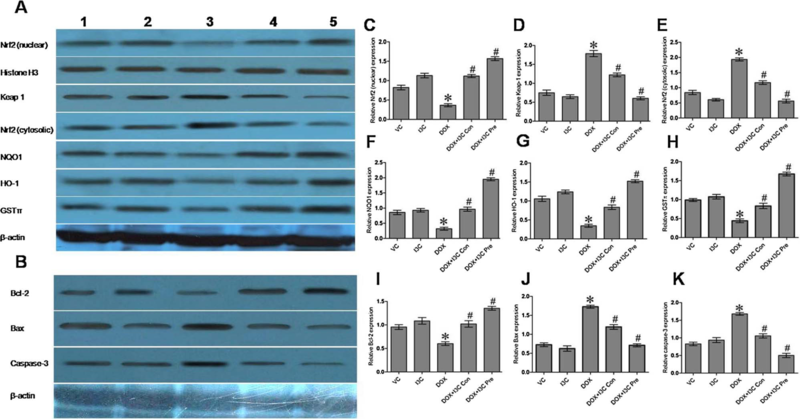 In addition, oral administration of I3C sig- nificantly (P < 0.05) mitigated comet tail length and Olive tail mo- ment compared to DOX-treated mice and prevented DOX-induced DNA damage in cardiac tissues, bone marrow cells and lymphocytes. In bone marrow cells, DOX-administration significantly (P < 0.05) increased the apoptotic index (%) by 84.59% compared to vehicle control group (Table 4; Fig. 3D). On the other hand oral administration of I3C significantly (P < 0.05) mitigated DOX-induced apoptotic cell death by 36.84% and 54.35% respectively in concomitant and pre- treatment schedule compared to only DOX-treated mice. To confirm the cytoprotective actions of I3C against DOX-toxicity in bone marrow cells we examined the Nrf2 activation pathway by wes- tern blot analysis. Results showed that DOX-administration sig- nificantly (P < 0.05) decreased the cytosolic expression of NQO1, HO1 and GST (Fig. 5A, lane 3) as compared to vehicle control group (lane 1). In addition, DOX-administrations significantly (P < 0.05) increased the cytosolic Keap1 expression (lane 3) compared to vehicle control mice (lane 1). In contrast, oral administration of I3C in concomitant (lane 4) and pretreatment schedule (lane 5) significantly (P < 0.05) enhanced the nuclear localization of Nrf2 as well as increased the cy- tosolic expression of NQO1, HO1 and GST in comparison to DOX- treated mice (Fig. 5A, lane 3). 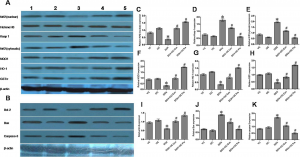 In connection with that oral adminis- tration of I3C significantly (P < 0.05) decreased the cytosolic Keap1 expression (lane 4 and 5) compared to DOX-treated mice. Moreover, oral administration of I3C, the level of Nrf2 protein in the nucleus was gradually elevated whereas protein level of Nrf2 in the cytoplasm de- creased (Fig. 5A). These findings indicate that the nuclear translocation of Nrf2 by I3C might facilitate the transcriptional activation of ARE dependent genes. Fig. 5 (C–H) also represents the quantitative relative expressions of the proteins. I3C induced Nrf2-mediated activation of ARE pathways as well as modulate the apoptotic/antiapoptotic pathways in bone marrow cells (A) Protein expression profile of Nrf2 (nuclear), Histone H3, Keap1, Nrf2 (cytosolic), NQO-1, HO-1, GSTπ and β-actin (B) Protein expression profile of Bcl-2, Bax, Caspase-3 and β-actin in mice bone marrow following different treatments. Lane 1: Vehicle-control group (VC), lane 2: only I3C-treated group (I3C), lane 3: only DOX-treated group (DOX), lane 4: DOX + I3C concomitant-treatment group (DOX + I3C Con), and lane 5: DOX + 3C pre-treatment group (DOX + I3C Pre). The bar diagrams showed relative band intensity of (C) Nrf2 (nuclear), (D) Keap1, (E) Nrf2 (cytosolic), (F) NQO-1, (G) HO-1, (H) GSTπ, (I) Bcl-2 (J) Bax and (K) Caspase-3. The results were normalized with Histone H3 for Nrf2 (nuclear), β-actin for Keap1, Nrf2 (cytosolic), NQO1, HO-1, GSTπ, Bcl-2, Bax and Caspase-3. Results were expressed as means ± SD, n = 6. *P < 0.05 statistically compared with vehicle control (VC) group and #P < 0.05 statistically compared with DOX-treated group (DOX) (one-way ANOVA followed by Tukey’s post hoc test).